World Down Syndrome Day (WDSD) is a global awareness day, meant to encourage people all over the world to help raise awareness of what Down syndrome is, what it means to have Down syndrome, and how people with Down syndrome play a vital role in our lives and communities. Why March 21st? The date for WDSD being the 21st day of the 3rd month, was selected to represent three copies of the 21st chromosome, leading to a Trisomy 21 diagnosis- more commonly known as, Down syndrome. Grand Strand Down Syndrome Society celebrated World Down Syndrome Day the whole week of March 21st! The Saturday before the big day, we set up at several locations to distribute our “Random Acts of Kindness”- this year, a little pack of fruit snacks attached to a card explaining World Down Syndrome Day. (Acts of kindness can vary, and are chosen by those doing the act). In 2019, Tony Zito, our volunteer coordinator, spent the week visiting our sponsors and gifting them a “Random Act of Kindness.” On March 21, he spent 4 hours at Coastal Carolina University, delivering these sweet packages to as many students as possible- educating and advocating. On Saturday, March 23, we celebrated one more time at the Surfside Bowling Alley, sharing time with each other. To make life better for people in our community who have Down syndrome and their families and caregivers, to offer support and information to families and professionals, and promote a positive image of Down syndrome in our area. 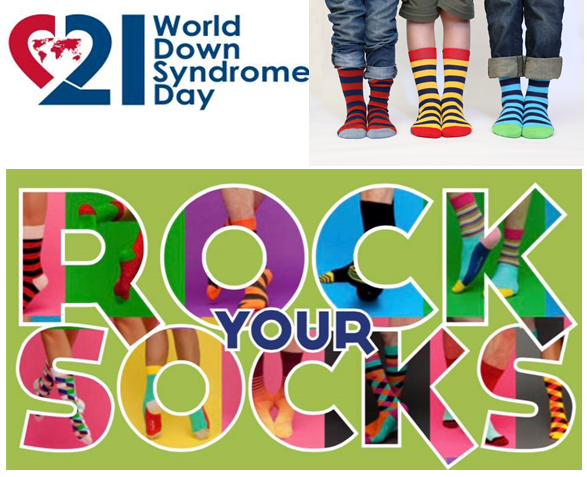 On March 21, take pictures of your friends and family wearing their crazy socks. Then share those pictures on social media #WorldDownSyndromeDay. Use this special day to be part of facilitating inclusion and raising awareness (regardless of your socks). If you are looking for a place to pick up your own crazy socks, visit our friend, John!